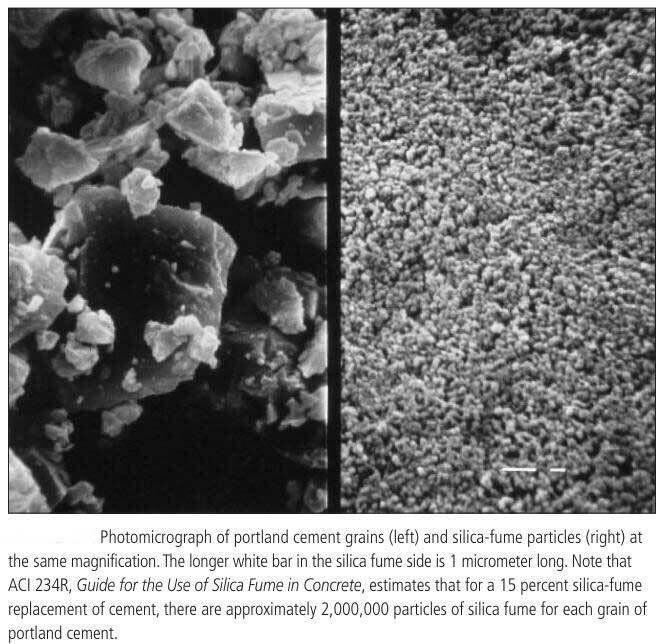 Silica fume is an ultrafine material with spherical particles less than 1 μm in diameter, the average being about 0.15 μm. This makes it approximately 100 times smaller than the average cement particle. The bulk density of silica fume depends on the degree of densification in the silo and varies from 130 (undensified) to 700 kg/m3 (densified). The specific gravity of silica fume is generally in the range of 2.2 to 2.3 m2/g. The specific surface area of silica fume can be measured with the BET method or nitrogen adsorption method. It typically ranges from 15,000 to 30,000 m2/kg.